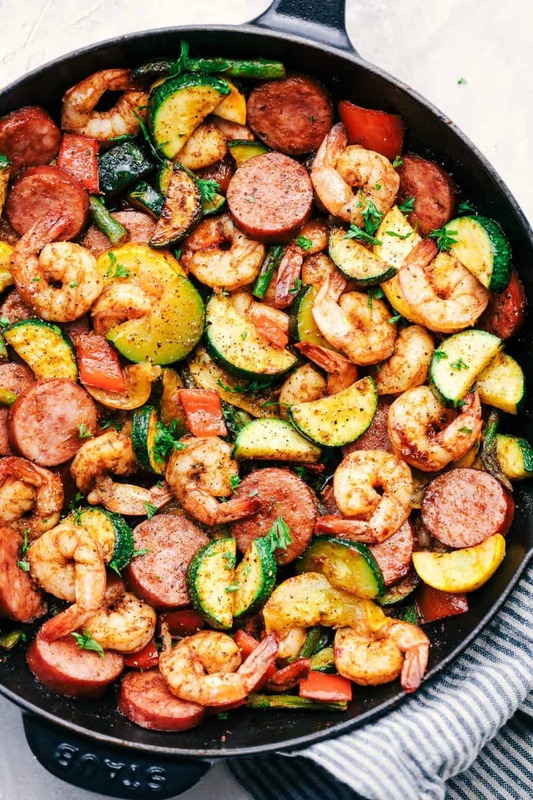 Cajun Shrimp and Sausage Vegetable Skillet is the BEST 20 minute meal packed with awesome cajun flavor with shrimp, sausage, and summer veggies. This makes a great low carb meal and is also great for meal prep! Summertime and getting into a swimsuit reminds me that I have got baby weight to lose. Now that our sweet girl is six weeks old, I can focus on myself now. Working out and eating better to lose the extra pounds. I was a lot more careful with this last pregnancy gaining weight, so I don’t have a ton to lose. But I can’t wait to start feeling better about myself and fitting in my pre-pregnancy jeans again. I love creating easy meals that are healthy and full of flavor. Since I don’t have a lot of time with a newborn, I love when I can create a meal that is ready in no time at all. This one just happens to be ready in about 20 minutes! This is a great family meal, but I actually used it for meal prep. It is delicious served over some brown rice, or quinoa and the cajun flavor is my favorite. 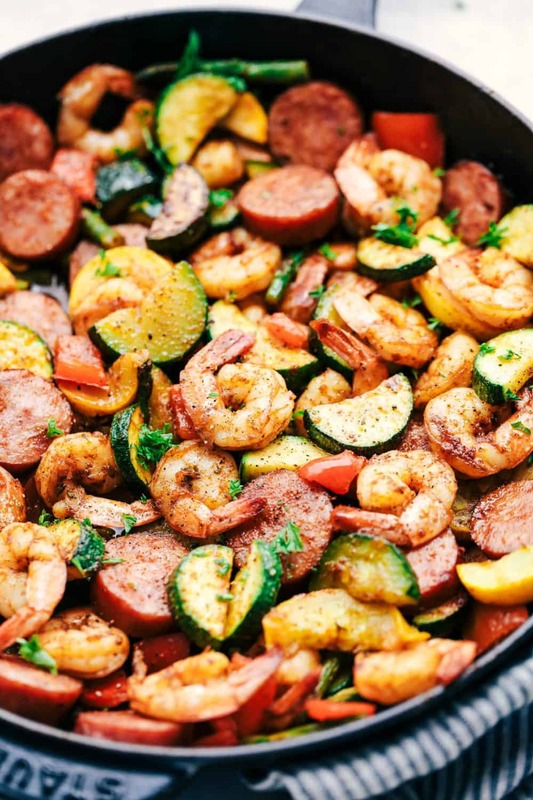 Shrimp and sausage go so well together! You can use pork or chicken sausage in this and I love how delicious it makes this meal. Cajun seasoning is one of my all time favorites and packs in delicious spices and a little bit of heat. It is perfect for adding flavor to this quick and easy meal. I included my favorite summer veggies. Zucchini, yellow squash, asparagus, and red bell pepper. It makes it a complete meal in one. 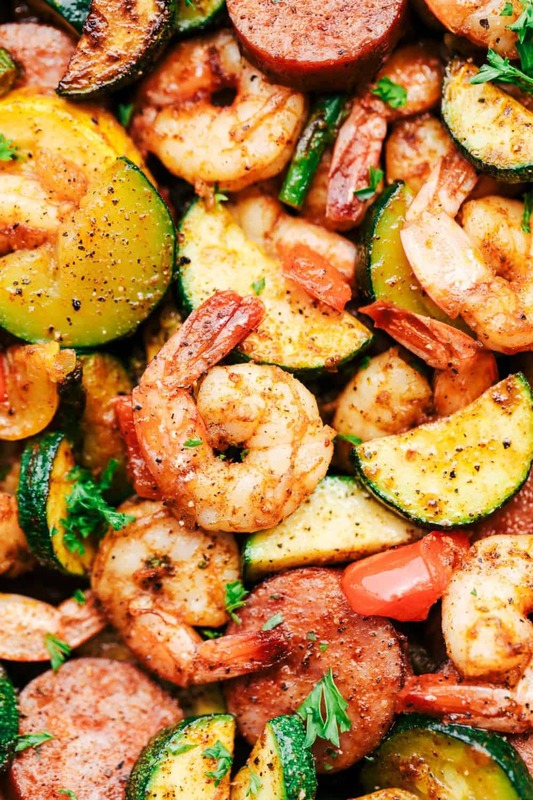 This is the perfect flavorful meal and helps you stay on track. It is such a delicious and easy low carb option and I don’t get sick of eating it throughout the week! If you are looking for a healthy and flavorful meal that is so incredibly easy, be sure to give this one a try! 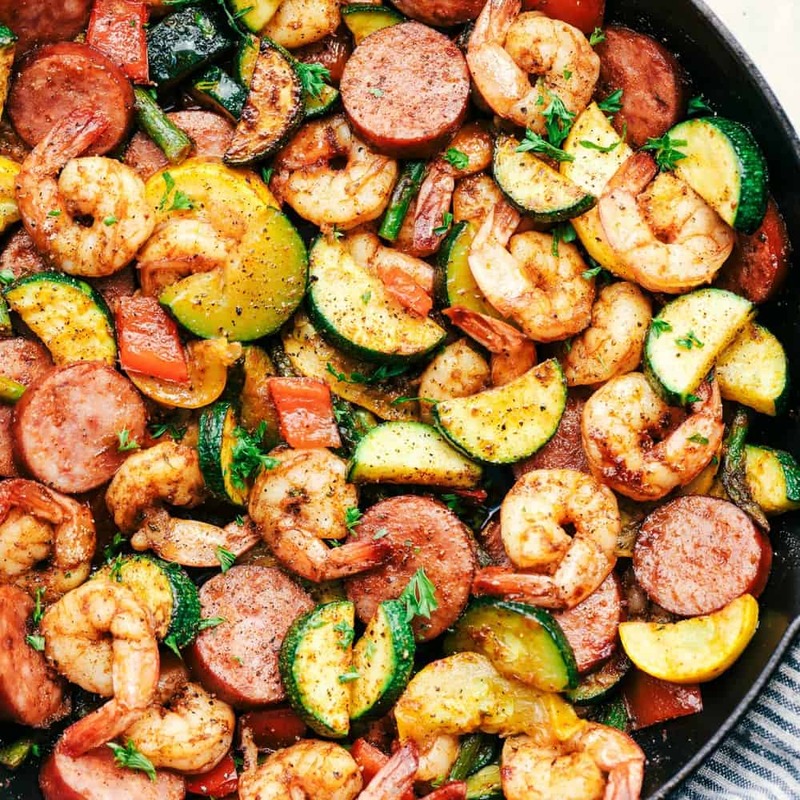 In a large bowl add the shrimp, sausage, zucchini, yellow squash, asparagus, bell pepper and salt and pepper. Add olive oil and cajun seasoning and toss until coated. Add to a large skillet and turn to medium high. 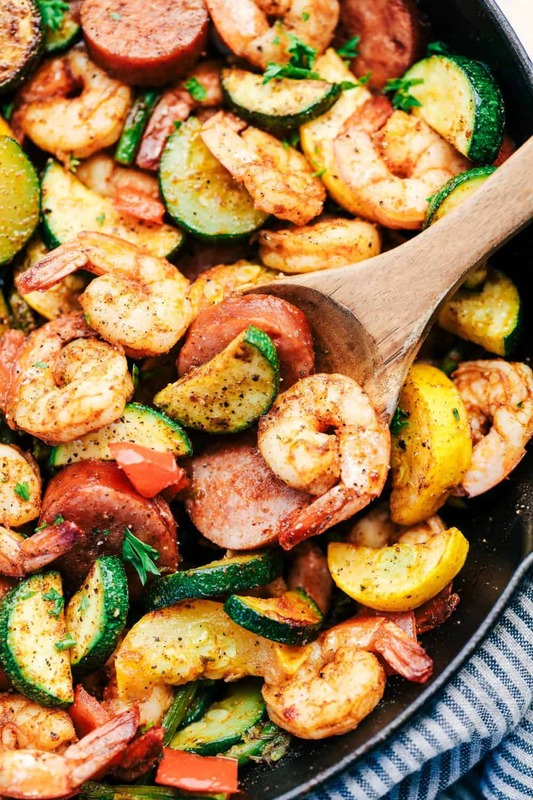 Cook for about 5-7 minutes until the shrimp is pink and the vegetables are tender. This recipe can typically feed 4 to 6 people well. I hope that everyone likes it! Let me know how it goes! Thanks for following along with me. Planning on making this but with chicken breasts cut up in chunks. Can’t wait to try it. Can you give nutrition info please? I like to use skinny taste.com or myfitnesspal.com for any nutritional information. Hope that helps! Tried this dish for the first time today and my family and I love it. For this recipe I just used the Cajun Seasoning in the red bottle. Hope that helps! Second time making this as its LOVE! However, def needed to use my wok as it was too much for any of my skillets! I also added a sweet onion and a diced jalapeño! DELICIOUS!! Yes, you can try it on a sheet pan perhaps and bake it that way. This will make 4 to 6 servings. Either one works great for this recipe. When I cooked this, my dish came out to be pretty watery. Any tips? Would love to make again. Maybe a higher heat. I went with medium high. You want it to cook fast to carmelize the outside of the veggies and heat them up, but not cook it so long that the squash gets mushy and watery. Make sure you cook just long enough to get the shrimp cooked all the way through. Can you used frozen shrimp instead of fresh and save time in devaining them? I used frozen shrimp.. bacon instead of sausage cuz I didn’t have it on hand iot turned out yummy!! Tried it and loved it, the right amount of “ heat” in the flavor, fed 3 adults, with seconds for two and enough left over for lunch. Hi! Would love to make this but I have some tummies that can’t handle too much heat, any suggestions to lower the spice? You can half the spice or omit it if that is going to be a problem with the dish. Hope you enjoy it! Need to know carbs and fiber please. I like to use myfitnesspal.com or skinnytaste.com for any nutritional information. Hope you can find what you are looking for.